Fortuna Yamaha Team Director Davide Brivio has revealed his surprise at Honda's decision to deny Valentino Rossi the chance to test the YZR-M1 before the end of the year. Brivio had hoped the MotoGP World Champion, who remains contracted to Honda until the 31st December, would be able to complete his first laps aboard the machine at Sepang later this month. However, Honda have refused to give special permission - despite allowing similar cases to go ahead in recent seasons. "I thought they would accept because that's how it's been over the last few years," commented Brivio. 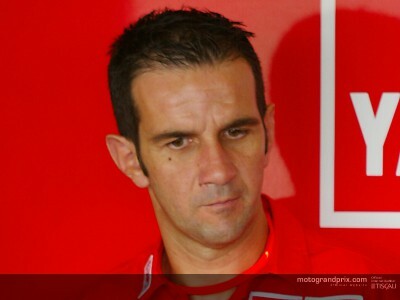 "Last year Biaggi tested the Honda immediately after leaving Yamaha, Melandri tested with us – as did Barros. Colin Edwards tested the Honda two weeks ago despite his contract with Aprilia. It seems to be generally accepted that a rider can test his new bike a little early, but I can understand Honda's decision. "Now we will just have to see if we can do anything to change the situation. The negotiations with Valentino and Honda have taken place with fair play and tranquillity. The relationship with Honda and Fiorani is excellent and this episode won't change that." The Italian added that the planned test in Malaysia will go ahead, with Rossi finally set to make his bow at the same circuit in January 2004. "We have planned a test session from the 28th to the 30th at Sepang and we will go ahead with that. Carlos Checa will ride with the Japanese test riders. Valentino, as it stands, would test on the 20th January – also at Sepang," concluded Brivio.